Everyone knows someone who needs to get out more (in my case, that person is me). This holiday season, why not kick them out of the nest with a gift of some theatre? You could even get an extra ticket yourself and join them! Heck, it's something to do after the BB gun gets taken away. Fortunately, the greater Los Angeles theatre scene offers a variety of ways to go about this, depending on your and the lucky recipient's interests. For major musicals, for instance, BroadwayLA offers gift certificates in amounts between $20 and $1000, redeemable for any show at the Pantages Theatre in Hollywood. Popular shows playing or opening soon at the Pantages include West Side Story, Hair, Traces, and Spring Awakening. Center Theatre Group, which operates the Ahmanson Theatre, Mark Taper Forum, and the Kirk Douglas Theatre, also offers gift certificates to all of their member theatres (in any amount!) as well as the option of giving season tickets to at least four of their available shows. For Orange County residents, the South Coast Rep offers the option of giving gift certificates to either a single performance, a season subscription, or any of the acting classes they offer. The Laguna Playhouse in Laguna Beach advertises a gift deal of two plays for $99. Other O.C. 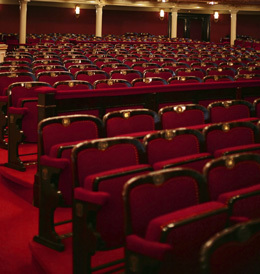 theatres with gift options include Chance Theater in Anaheim Hills and the Orange County Performing Arts Center in Costa Mesa. Goldstar.com is a popular site that sells half-price tickets to a wide range of live entertainment, and they offer gift certificates usable at any venue that has an agreement with them. Theatres like working with Goldstar because it allows them to fill seats (even at half price) that may have otherwise been empty. The number of small theatre companies scattered around the Los Angeles area precludes me from listing them in this article, but that doesn't necessarily mean that they too are not in on the "give the gift of theatre" game. Search the "Now Playing", "Coming Soon", and "Top Rated Plays" pages on TheatreInLA for a show that interests you, then check the company's website. If nothing is listed, give them a call. They may not offer formal gift certificates, but you might be surprised how many small theatres would be willing to work something out if it means more bodies in their seats. Finally, while this desire for your patronage does mean that most places are fairly generous with things like expiration dates, remember that return policies, blackout dates, and other specifics will vary. Be a defensive shopper and read all terms and conditions carefully, and make sure the recipient understands them as well.